BRIAN WILLIAMS, anchor: Back on September 17th , very few people had heard of the protest movement called Occupy Wall Street , but they did and they sure have since then. And so far there have been over a thousand arrests across the United States as the movement spreads. They share a heritage with other big protest movements in American history -- some of them have changed history -- even though this protest doesn't look the same or take the same shape exactly any two days in a row. It's on the move, the players change, but the center of the message is increasingly resonating. The crowds tell us that; now the polls tell us that. But tomorrow here in New York an important moment arrives right where it all started. It's where we begin tonight with NBC 's Mara Schiavocampo . Mara , good evening. MARA SCHIAVOCAMPO reporting: Brian , good evening. Protesters here at Zuccotti Park are bracing for a showdown with police tomorrow because the park's owners say they want the group temporarily moved, this as demonstrations continue to take hold around the country. Almost one month in, the Occupy Wall Street protests are growing in number and intensity, thousands taking to the streets in at least 190 cities nationwide. The latest NBC News - Wall Street Journal poll finds 37 percent of Americans support the protesters, with 40 percent of wealthy Americans backing the movement, more than any other income group. Representative JON LARSON ([shown on screen] Democrat, Connecticut): What we've witnessed across America in the last several weeks are our citizens taking to the streets, born out of frustration. SCHIAVOCAMPO: In Washington , DC , today, eight arrested after gathering at the Capitol . Unidentified Woman: Why am I being arrested? SCHIAVOCAMPO: The last few days have seen an escalation in demonstrations and clashes from Boston to Seattle . Overnight, police in Portland cleared the streets, tearing down tents. Lieutenant ROBERT KING (Portland Police Bureau): We're going to stay here as long as it's necessary to ensure that the street remains open. SCHIAVOCAMPO: Now protesters at Zuccotti Park in Lower Manhattan , where the movement began, are bracing for a showdown. Unidentified Man: Nobody's leaving. They can carry everybody out in handcuffs like they did on the Brooklyn Bridge . SCHIAVOCAMPO: After vowing to let them camp out indefinitely, city officials now say demonstrators must leave for park maintenance. Park owners want them out. Commissioner RAY KELLY (New York Police Department): They now have decided that they want to clean the area and they're going to do that. Commissioner KELLY: We'll stand by to make certain that, you know, the peace is maintained. WILLIAMS: Mara Schiavocampo in Lower Manhattan tonight, starting us off. Thanks. 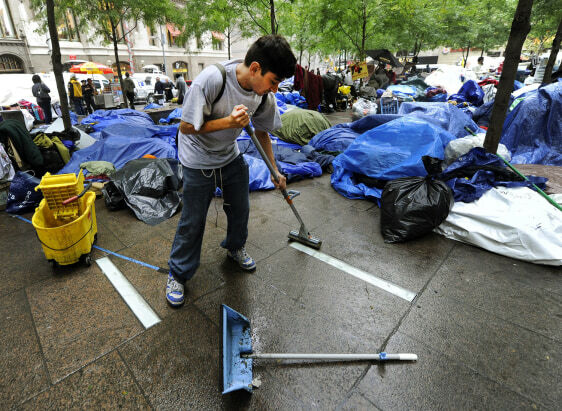 Demonstrators with 'Occupy Wall Street' protest at Zuccotti Park start cleaning up their belongings Oct. 13, the morning after Mayor Bloomberg sent out a message that the park needs to be cleaned. Protestors were told that, signs, sleeping bags, and other items need to temporarily be removed so the park's property owner send in a cleaning crew starting Friday.